Arun, I’m not sure what you mean that WCF is too large/heavy. If you’re referring to WCF’s rich service-oriented aspect support. I must disagree. From my experience in the wild, this is just the rich support you will need as... Read More. Hi Audra, Thanks, I will have a look. Workshops, sessions, and keynotes were recorded and the video compilation is now available for purchase. 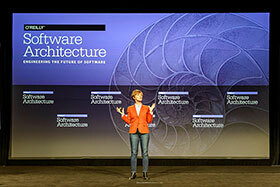 Fast-paced and practical, the O’Reilly Software Architecture Conference provides the training that veteran and aspiring software architects, engineers, and senior developers need to stay current with emerging technologies, hone their leadership skills, and support the success of their businesses. The most important elements of architectural judgment—strategies, principles, heuristics, techniques, and more. Architectural thinking—learn from recent case studies, and see side-by-side comparisons of frameworks, microframeworks, and other technologies. The soft skills essential to this role: leadership, collaboration, and interacting with all levels of your organization (which often means speaking the language that other departments speak). If you're a software architect, aspiring software architect, software engineer, or developer, the O'Reilly Software Architecture Conference will give you a solid foundation in the skills you need to succeed. Whether or not you're attending the rest of the O'Reilly Software Architecture Conference, plan to join us on Tuesday afternoon for this half-day workshop: Integrating OpenStack and CloudFoundry for Cloud Native Enterprise Application Development. Get the professional knowledge you need in one place. Staying current with new trends, philosophies, and best practices is one of your toughest challenges. The practical program at the O'Reilly Software Architecture Conference lets you home in on the topics that matter most. Learn from the best—and make valuable connections. Our speakers are the best and most original minds in the field. They're distinguished by their passion for technology, hard-earned expertise, and willingness to share their knowledge. Between sessions, you'll meet and compare notes with other professionals. The people you meet at the O'Reilly Software Architecture Conference may turn to out to be the most worthwhile connections in your career. Get solutions that you can apply today. Make a list of your biggest headaches and compare it to the conference program. Odds are, the solutions await you. Learn from others' success stories and failures. Get side-by-side comparisons of the latest products and technologies. Learn how other organizations structure their work, identify strategic outcomes, and successfully deliver. Expand your skills with professional training. In addition to conference sessions, you can add two days of highly focused professional training, covering topics like Fundamentals of Software Architecture, Building Microservices, and Cloud-Native Application Architectures. Save time and money by nurturing your team. No one knows your organization like the people who are already working to achieve your goals. Increase their value and productivity (and yours) by learning how to develop their technical and leadership skills. Join us in March at the Hynes Convention Center in Boston, MA. Take a look at the schedule and start making your plans today. Need help convincing your manager? We’ve got you covered.